In 2003 United were close to pulling off a major coup when they entered negotiations with Emirates Airlines in plan to have the Dubai based company replace Telewest as shirt sponsors for the 2002/04 season, after the seven year association with the Telecommunications company came to an end. However, the ambitious deal broke down at an advanced stage and United were left with the possibility of going into the new season without a shirt sponsor. Chairman Eddie Thompson, who had assumed control of the Club the previous season, stepped in at the last minute to arrange a deal with his chain of convenience stores, Morning Noon & Night, to have their logo displayed on the United jerseys for the coming season, in white text with black edging. The previous three year deal with TFG Sports was extended for a further season, with their Home strip design being nothing more than a plain tangerine shirt, with a round crew collar, although there were mesh panels at the sides and under the arms for air circulation. 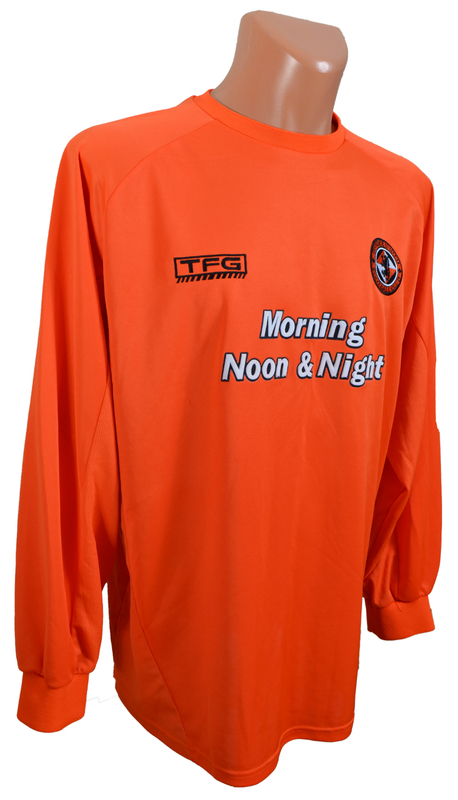 With the 2003/04 season being the tenth anniversary of United's 1994 Scottish Cup win, it was decided that the shorts of the Home kit should be tangerine, in homage to the kit United worn in their Cup winning season, and along with the tangerine socks, it was only the second season that United had an all tangerine strip since the mid 1970s. The new look Home kit made its debut whilst a new look United side took to the field on the opening day of the 200/04 season, with manager Ian McCall's newly rebuilt side losing 1-2 to Hibs at Tannadice. This turned out to be the teams best season in six years, with United finishing in the top six of the SPL for the first time since its introduction in 1998.